Did you ever feel you had something special back when you were playing tennis-ball cricket on the beach? I knew that I could bowl well with the tennis ball, but at that time I hadn't even touched a leather ball. I had no idea that I had the ability to be good enough to play for Sri Lanka. That's something that makes me very happy, to see how far I've come. Champaka Ramanayake took an interest in you early on. How different would your life have been if he hadn't seen you? I met him about ten months after I first started playing leather-ball cricket. Since that day, he has done a lot for me. He has been around the A team, club cricket and the national team, and he has helped me in all those capacities. I knew nothing when I started playing with the leather ball - how to control the ball, how to reverse swing it, how to vary the speeds. Under Champaka sir, I was able to learn all that. I didn't get a lot of opportunity to play school cricket, so the person that helped me get into the national team was Champaka sir. He hadn't seen someone like me before. He didn't say anything major. Just, "Bowl as fast as you can, as straight as you can." He didn't try to tell me where my arm should be or anything like that. Even today, he says the same thing to me. He never tried to change who I was, and that's why I've been able to come as far as I have. There were a lot of other coaches who really helped me - Anusha Samaranayake, Prabath Nissanka, Rumesh Ratnayake. I am incredibly grateful to them. You practised bowling yorkers by placing two shoes on the crease and trying to hit them. How did you come up with that? I used to watch Waqar Younis and Wasim Akram on TV and thought that the yorker was a great ball to bowl. We have a saying that it is better to learn from watching than from hearing. I thought I must learn the thing that I love to watch. The yorker was successful for me, so I thought I would make it even better, and I imagined that a batsman was at the crease and tried to hit his feet. Reverse swing came naturally to you with your action. Are you disappointed that you no longer play Tests, where reverse swing is more effective than in other formats? Definitely I am sad about that. I came into the national team as a Test cricketer. I learnt a lot from playing Tests - how to bowl with the new ball, how to get the better of a batsman once the ball had become old, and it showed me how to always look for wickets. It makes me sad that I can't play Tests anymore because of my injury. I only played 30 Tests, but what I learnt in those matches has helped me get a lot of ODI and T20 wickets. It was only in my 29th Test that I learnt to reverse the ball in both directions. In that match I took seven wickets, against India in Galle. After that series I wasn't able to play any more Tests because of my knee injury. I always ask why that happened to me. "I used to watch Waqar Younis and Wasim Akram on TV and thought that the yorker was a great ball to bowl. I thought I must learn the thing that I love to watch"
You retired from Tests in the middle of an IPL, after you had been named in a Test squad to England. Why didn't you announce your retirement earlier? I picked up this injury in 2008, and that's when I had a long time away from Tests. For three years, no one looked at me for Test selection, no one looked to see how I was bowling. But in 2010, when Murali aiya was retiring, he talked to me and said, "Mali, this is my last match. Do you want to come and play another Test with me?" I respect Murali aiya a lot, and no one can ever say a bad thing about him, so I thought, "Even if this is my last Test as well, even if I break my leg playing it, it doesn't matter." In three years I hadn't even played a two-day match. But still, I was able to be the Man of the Match, by taking seven wickets and making 64 runs, and Murali aiya got to take his 800th wicket. I only played that Test because he asked me. After 2008, I had given up any thoughts of playing Test cricket. The reason was that the knee injury I have is something only four or five other people in the world have - mostly Aussie Rules football players, no cricketers. My doctor told me it would never get better, and that I might have to give up cricket altogether. There was a small chance it would get better, but I would have to spend a long time away from the game. Luckily I got to the stage where I can bowl a few overs a day, but that's why I had to give up Test cricket. When you played all three formats, which did you enjoy the most? I loved playing Tests because you get the chance to bowl so much. In ODIs it's only ten overs and in T20s it's four, but in Tests you can bowl 20-25 overs a day. Because of that, in Tests you gain a lot of experience, and learn what to do in specific situations. How should you bowl with the new ball in the morning? How should you bowl in the afternoon when it's hot? How to bowl at the end of the day? But I can't do that anymore, and there's no point dwelling on the past. I can only play well in whatever formats I can still play in. You don't think you will ever play Tests again, then? I'm 29 now. I think I will only have three or four more years to play. I think going back to Tests now would be very difficult. I've been away from Tests for one and a half or two years. I have 100 Test wickets now, and I feel like if I were to play again, I would want to get to at least 150 wickets. To do that I would have to play at least ten or 15 Tests, and I don't think I can do that, given how bad my injury is. I think it's much better for the team if a new bowler comes through and plays three or four years at a stretch than if I play for just a few. You've played in all four of Sri Lanka's World Cup and World Twenty20 final defeats. How did you prepare for those matches? I didn't do anything different. I played under Mahela and Sanga and they gave me the freedom to be myself and bowl the way I thought was best. In the first three finals I was good, but in the last final I couldn't bowl well. I think I was a big reason why we lost. I felt helpless and couldn't do anything for the team. But I was glad I was able to take five wickets against England in the Super Eights and bowl a good Super Over against New Zealand. I'm very sad about the final, and what I couldn't do there. But at least I've been able to play in four finals. Do you talk to Mahela Jayawardene and Kumar Sangakkara much about your game? I don't talk a lot about cricket with Kumar - not that I totally don't, but not often. But I'm always talking about cricket with Mahela. We talk about how I should bowl when a batsman is playing in a certain way, what balls to bowl in certain conditions, and he has had a lot of input and influence on how I play. We talk cricket all the time. You've profited a lot from the IPL. Do you think you have ever compromised your international career for Sri Lanka because of it? I have never done that. 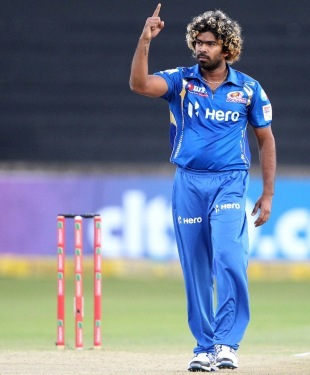 I only played in the IPL after I stopped playing Tests. I haven't neglected any limited-overs matches for Sri Lanka because of the IPL. As long as I am playing cricket, I am always ready to play ODI and T20 cricket for Sri Lanka. You've said that because no one is looking out for you, you have to look out for yourself. Why do you feel that way? As a cricketer, you have a shelf life. You sacrifice your education and any other line of work to play cricket. The best cricketers might play for ten or 15 years; others might have only five or six years at the top. You don't know at what time you will be injured or at what time you will lose form, and how long you will stay in the team. I think in that short time that you have, you have to do the best for your team and do everything you want to. After you leave cricket, no one cares about you. I've seen that happen to former cricketers. I know that that will happen to me as well. So I just want to play as well as I can when I can do it, and one day be able to reflect on the number of wickets I've taken for my country, and the number of wins I've been able to deliver. In ODIs, how much has the "new ball from each end" rule affected your bowling towards the end of an innings? It hasn't just affected me, it has hurt a lot of Asian bowlers who rely on reverse swing. It's much more difficult to take wickets at the death now. I really hope that that rule is reversed and that we get one ball per innings. There would be some kind of justice for bowlers if that happened. "If I were to play Tests again, I would want to get to at least 150 wickets. To do that I would have to play at least ten or 15 Tests, and I don't think I can do that"
Even in T20s, over the past 12 months you haven't been able to bowl as well as you used to. You've having particular trouble with finding the yorker length. Why is that? Yes, I haven't been able to bowl my yorkers as well as I want in both international cricket and in the IPL, and I haven't been able to get as many wickets. I think because I've been playing non-stop for so long, I'm physically drained. I've played in every match that I was fit for. I need to take some time out and re-energise, and I hope that I can return to where I was. Do you think you've become too predictable? I guess batsmen know the deliveries I bowl, because they've analysed me on video, just like we do to other bowlers and batsmen. That is the nature of the game now. There are new rule changes as well, and I can only be successful if I adapt and handle pressure well. I think in future bowlers will be under more and more pressure. There are no new balls that I can learn; I know how to bowl everything. But in saying that, there are subtle changes I can make to some of the variations to make them more effective. I'm working with the coaches and with the team leadership on what I can change. How does it affect you when it is said that you are only motivated by money? Some people look at me in a bad light and say those things, but I don't think you can look at the wickets I've taken for Sri Lanka and be justified in saying that. They say I only play well for money, but I've set four world records playing for my country. If I was just playing for money, I should have achieved those things in the IPL. I've taken three hat-tricks for Sri Lanka. All those things I've done playing for Sri Lanka. I have taken 200 ODI wickets for Sri Lanka, and I'm the fastest Sri Lankan to have reached that milestone. In 30 Tests, I have taken 101 wickets. There again, I am the fastest Sri Lankan. If those people look at what I have done properly, they will be able to see what my motivation has been. What would you most like to achieve in the time you have left in the game? I'm hoping to take 100 wickets in T20s, and if I can play long enough, to take 300 wickets in ODIs. Most of all, I just want to take my team to as many victories as possible for as long as I can.